Article by Tom Hallman Jr. Officer Cassandra Wells says Murphy did a great job helping her make an arrest last week. 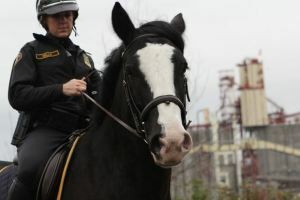 A horse that earned his way onto the Portland Police Bureau’s Mounted Patrol Unit last year after dropping 200 pounds and getting in shape was credited with making his first collar last week. Murphy, carrying Officer Cassandra Wells, chased down a man suspected of breaking into a building in Old Town and kept him trapped next to a building until cops could slip cuffs on him. The suspect ran about six blocks — Murphy galloping after him — before the big horse cornered him.